What's the deal with little cups of yogurt? Just a few years ago, fermented-dairy eaters had a choice between Dannon and Columbo. Remember Columbo? I didn't...I had to ask my coworker to help me come up with the name of "that other major yogurt company when we were growing up." Now, I see customers standing dumbstruck before the yogurt shelf, not knowing whether to reach for full-fat sheeps' milk, low-fat cows' milk or even a soy. So, I figure, it's time for a massive yogurt taste test. You ready? If I were a purist I would taste only plain yogurt, but this is my game, and I don't wanna. So I'm going to do the best I can comparing different brands by eating their most enticing flavors. Packaging: Your standard, super-busy, kid-friendly, colorful yogurt container. The background is purple, the cherries are red, the wording is white and yellow, the Cabot logo is red, green and white. You get the idea. I don't find it that appealing, but my eyes gravitate towards it nonetheless. Like TV. Nutrition Info: 8 oz. serving. 150 calories. 0% fat (DV). 0% fiber (DV). 21 g. sugar. 9 g. protein. 25% each: vitamin A, vitamin C, calcium, vitamin D, vitamin E (DV). Active Cultures: Acidophilus and Bifidus. Appearance: Kind of blobby. The black cherries are mixed into the yogurt, so the product is pale purple with cherry chunks, and being non-fat, is thin enough that it was clearly squishing around in the package and climbing the sides of the container before I got around to opening it. Aroma: Pleasant, but smells less like yogurt than it does like black cherry soda, which I admit that I'm partial to. Really, that's about all I can smell. Mouthfeel: Thinner than the full-fat stuff or the skyr, but not watery. It's the consistency of all the yogurt I grew up eating. After swallowing, the yogurt seemed to leave a bit of a gritty feeling. Taste: A little tangier than some of the other yogurts, this one gave me the slightest hint of shivers. There's a very slight bitter note, and less sweetness and fruitiness than I expected. The black cherry aroma seems to be stronger than the cherry flavor. Notes: If you buy into the low-fat thing, which I emphatically don't, this could be considered one of the healthier products out there: It's low in calories and fat-free, with some added vitamins to pump up the nutritional profile. The mouthfeel is fine, although I wonder if the grittiness I noticed came from the modified cornstarch on the ingredient list. The flavor is o.k., too. But I'm not wild about it. I wouldn't choose to eat this for enjoyment. However, it is local. Yum! Black cherry is my favorite flavor! Hey did you hear about the recall of Fat-free Blueberry Stonyfield yogurt? Apparently there might be glass particles in it. Yikes! Good thing I don't like blueberry. 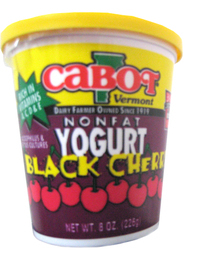 Cabot's started making a line of Greek-style yogurt which is very good, but may not be widely available. The Shaw's around Montpelier give it a sliver of shelf space next to the regular Cabot's. The Cabot greek style is great! Their dulce de leche flavor is our new favorite dessert. It has a pleasantly tangy flavor and thick texture.The only place I've been able to find it so far is, randomly, Greg's Meat Market in Middlebury.